The Team Blog Index was unchanged with little movement in its component sites. 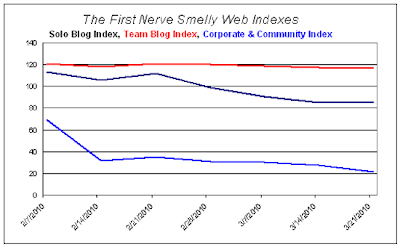 The Solo Blog Index was also unchanged even as AyalaSmellyBlog raised its Alexa ranking 13%. BoisDeJasmin was down for the fifth consecutive week. A nice gain at PerfumeShrine broke a six week losing streak; the stat monkeys have quieted down but not withdrawn their predictions. The Corporate & Community Site Index continued to deflate, setting a record low for the fourth straight week. OsMoz was off again; too early for the rankings to reflect the site's new redesign which includes a perfume-blog aggregator and more videos.